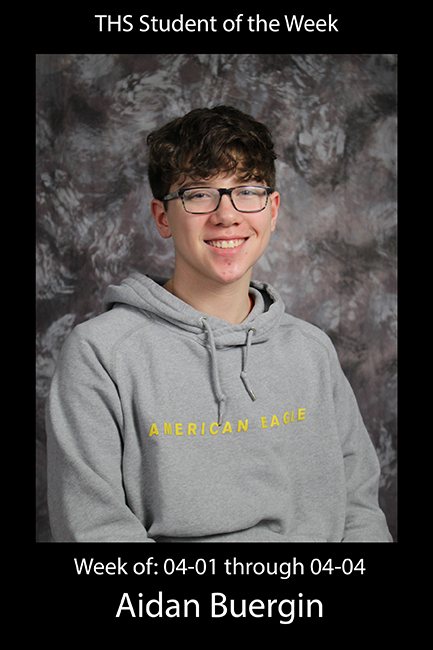 It is always interesting to hear about students’ extra curricular activities and Aidan Buergin, a freshman, didn’t disappoint when he described his passion for fencing. Aidan is this week’s Student of the Week thanks to Ms. Jorgensen’s nomination. “Aidan always comes in to class ready to work! When he is absent he makes up the work quickly. He is always willing to help out his classmates when they need help and is consistently participating in class discussions.” Aidan confessed that most academic material comes to him easily, but he has found that his best study strategy is to wake up one hour earlier the morning of the quiz or test and focus solely on reviewing the material. He believes he is successful because he holds himself to high expectations, like straight As. Currently Aidan is well on his way to straight As for his freshman year despite having a challenging course like AP U.S. History. Aidan has been fencing for the past five years since he noticed the sport on a television sitcom and determined he had to give it a try. Now he is traveling around the United States competing in fencing tournaments. Recently he went to the Ohio NACs (North American Cup saber) tournament and was awarded a $2,500 scholarship for his essay on fencing. Aidan spends three to five days practicing fencing in Rockville and hopes to one day achieve a college scholarship in the sport. Aidan is on point with fencing and academics thanks to his drive and his role models, his parents and fencing coach. Aidan described his mom as “really hard working and pushes me to be the best I can be.” His dad knows, “every piece of trivia and never forgets anything.” Aidan is ready to advance on both the fencing strip and a challenging academic path.